Chicken Enchiladas with Ricotta, easy dinner recipes. This will use the last 4 enchiladas from last month (check freezer)... or buy more and make Taco Chips. Using ricotta (app. 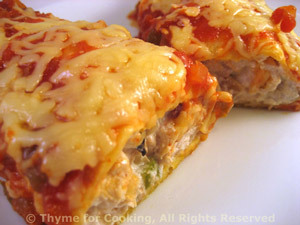 135 calories per 100 grams v 400 for cheddar) makes a lighter enchilada with a luscious, creamy center. With a bit of sharply-flavored Parmesan on top you won't notice that it's 'lighter'. Cut the chicken into large bite-size pieces. Drain chiles. Chop chiles if whole. Add onion, celery and sauté until onion is tender and translucent, about 5 minutes. Remove from heat. Add green chilis and ricotta and mix well. Heat a large nonstick skillet, over medium heat. Warm one tortilla in the skillet for 15 - 20 seconds. Spoon one fourth of the chicken / ricotta mixture onto the tortilla and roll up. Pour taco sauce over the top - how much depends on your taste. I use 1 jar now and the rest as additional sauce at the table. Remove foil for the last 5 minutes to brown the cheese if you like.